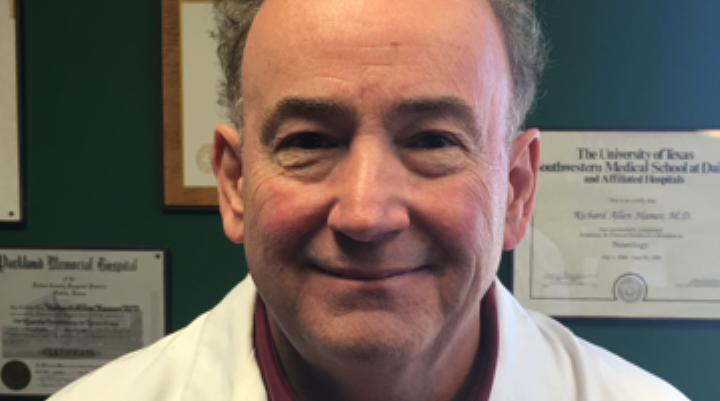 Dr. Richard Hamer, MD is in practice in neurology in Longview, Texas, and has been there since 1995. Dr. Hamer went to medical school at the University of Alabama in Birmingham, and did his residency at Parkland Hospital in Dallas, Texas. He practices general neurology, and has privileges at Longview Regional Hospital. He is with a group called the Diagnostic Clinic of Longview. Dr. Hamer has been with them since 1996. It’s a multi-specialty group and there are three neurologists in the group, including his partner, Dr. Perkins, who he has been in practice with since 1995. Dr. Hamer has been a Texas Super Doctor in Texas Monthly Magazine for 11 years in a row. He is also Board Certified in Neurology, as well as Vascular Neurology. Dr. Hamer has been married for 27 years. They have two boys, and they are both in businesses for themselves. One is in Denver and one is in Baton Rouge. They each own an Anytime Fitness’s gym, which dictates where they will live. His hobbies are going to the movies and playing tennis. We like to travel. They also travel to New York at least once a year and go to Las Vegas a couple of times a year. My brother is a doctor and my Mother was an anesthesiologist. The medical profession has always been in my family, so I’ve been around it most of my life. My father was an aerospace engineer. I enjoy helping people and my focus is in general neurology, which includes strokes, Parkinson’s disease, tremors, headaches, seizures, and I also see patients with dementia including Alzheimer’s dementia. Pretty much every day, we usually start the office at 7:30 in the morning. We usually end about 5:30 or 6 in the office. Then, if I have some hospital patients, then go around at the hospital, and usually finish up about 7:00, 7:30. We also do some procedures such as EMG and EMG/NCV, which is a nerve test that is performed in the office. The patients I see in the hospital, for example, have had a stroke and need immediate care. I love the patients. You know, I learn something every day in this job. Mot a day goes by in all of these years that I haven’t learned something from my patients, and I love the interaction with them. Some of the patients I have seen for 25 years, and they’re just like family. At the moment I have about 2000 patients and I generally see 35 per day. I have to be and stay active. I can’t just sit. Now that I am over 60, I am not required to take call anymore, which I did since 1989. This allows me more down time and more time with my patients. That’s a good question. After all these years, I’ve gotten really good at leaving the job at home when go on vacation or when I go home. I just don’t think about it. It was really hard when you first go into practice because when I was off I would be worrying about a certain patient. I’ve got to a point now that I just make sure everything’s done correctly during the day. That way, I don’t have to worry about them at night. I will stay in the office and make sure their issue is resolved before I think about leaving for the day. Oh, that’s a good question. You know, I guess I’ve been lucky enough to save people’s lives by finding out what is wrong with them. This is something that will actually change their lives, or prolong their lives, so that’s a good thing about medicine. We get to help people, but sometimes you even get to save their lives. When they come up to you and tell you that you helped them, it just makes you feel really good that you’re out there doing something important. Every night I go home and listen to music. I have a turntable and I collect albums, and then go home. I guess that’s what I did last night. My sons gave me some new albums for Christmas and so I went home and listened to one of them. And what kind of music are you listening to? I like everything. Last night I was listening to George Thorogood, which is kind of rock and roll, bluesy stuff. But you name it, I have everything from classical to country. I listen to it all. Nice. And how big is your record collection? Oh, gosh. I’d hate to even count them! You know, I would say more than say 300 records have been collected. It makes it easy for my children to shop for me! So they’ll get me four or five albums for my birthday or Christmas. Makes it easy for me to go home home an put on a record.